In Penelope and The Movie Star, Marvel Movies comes to Penelope’s school to shoot a motion picture against the backdrop of the old Windorf Hotel that now houses the school. She sneaks onto the set and watches a scene being filmed. Famous actors Priscilla Young and Clarence Dodd star in the movie and Penelope gets to see them up close. Regrettably, she also sees a spotlight fall on the director and kill him. Penelope claims she had her eyes shut when it happened, but the police think she may remember something. Unfortunately for her, the killer also thinks she may recall something. A Penelope mystery story (there are two others) can be enjoyed by tweens and adults alike. The stories are laced with humor while presenting a whodunit that will leave you guessing until the end. I had two books with an agent for a number of years. While she got close calls, she never landed a publisher. I believed in my work and, by mutual agreement, I withdrew the books. I have no regrets. Before, I waited for the big break, wondering if I it would ever come. As an indie writer, I can hardly wait to publish the next book. I had a few short stories with a literary magazine many years ago. The Penelope mystery series are my first books published. It’s great! Self-publishing is a lot more fun than waiting around for a publisher. And look at all the people who have self-published and later found a traditional publisher. The experience gained cannot be matched. I wish I knew the most successful technique to market books. I’d sell it for a million dollars. My philosophy is to keep my name and my books out there. Twitter. Blogging. Getting interviews and reviews. The name of the game is branding. People need to recognize your product. That means you and your book. In April, I’m planning a blog tour and will see how that works. I don’t do press releases unless I have a publication that wants to do an article on me and my books. I’ve done some book signings but not with great success. The problem is my books are middle grade reading and not many 9 to 12 year olds come in a bookstore with ten bucks in their pockets. 7. What’s the most important thing you’velearned about self-publishing that you didn’t know when you started out? You don’t have to spend a lot of money to get your book out there. Just be willing to do as much as possible yourself. I figure I can put a book out on all major e-book platforms and a paperback edition for less than a hundred dollars. I know one writer who did it for half that. Just be ready to learn and do it yourself. Right now I’m happy with the way things are going and wouldn’t change it. This is a great time for indie writers to get books out there. The big names in book selling have made it easy to get published. Unless you have a big name backing you, I don’t think there’s much difference between self-publishing and traditional. And if you have a big name backing, most likely you are a big name writer. I know a writer who has a publisher and she is doing all the things a self-published author does. My next book is a paranormal mystery for adults titled The Witch’s Daughter. Cavendish Brown finds himself stuck in the small town of Maiden Falls, WV, solving a cold case murder where his sidekicks are a psychic with the mental age of a twelve year-old and a Gothic girl who just might be a witch. Plans are to have it in the May-June timeframe. I write mysteries that take you on a roller coaster ride from start to finish. My other books Penelope and The Birthday Curse and Penelope and The Ghost’s Treasure are available at Barnes & Noble, Amazon and lots of other places that sell e-books and paperback. 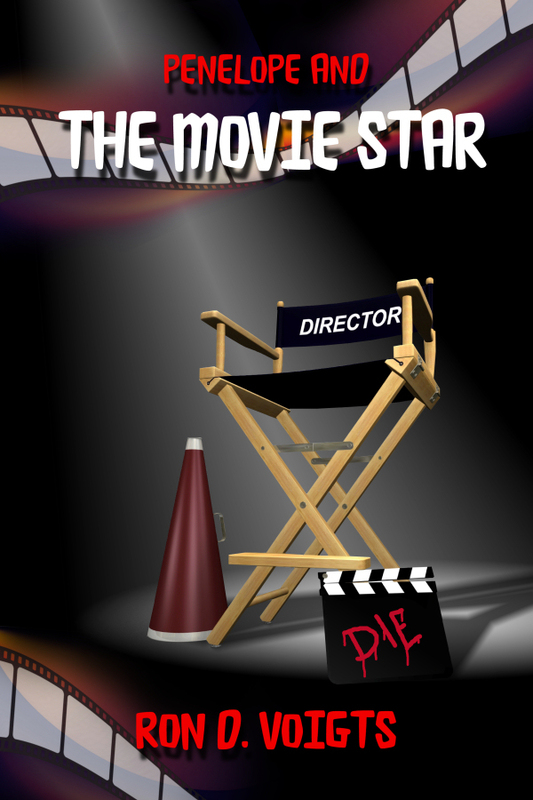 My latest in the series, Penelope and The Movie Star, is only available at Amazon in e-book format, but by summer it, too, should be on more platforms and bookseller sites. For the month of March, it’s available for $0.99. Having read all of Ron’s books, they hold enjoyment for adults as well as his targeted audience.